To educate, innovate and inspire entrepreneurial philanthropy* by creating partnerships and leading by example. We believe in empowering the community through education to ensure that people have the tools, resources, abilities and training to make their dreams a reality and create their own path to prosperity. By investing in people, we reap returns that benefit not only the individual, but our entire community. 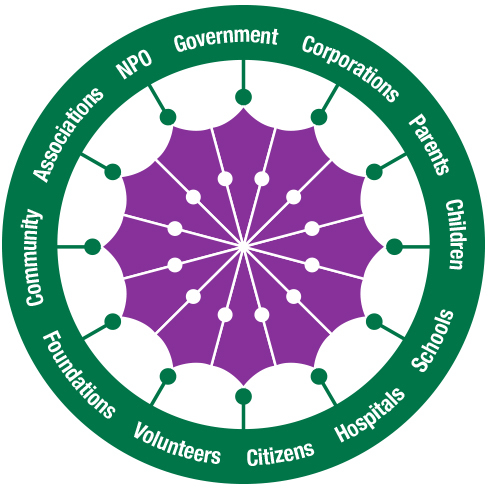 The way we see it, each part of the wheel has an important role to play when it comes to bringing about positive change. But, it is only when working together that they can take on the shape of the circle. The center of the wheel, our conception of the better world we are all working to create, takes on the shape of the heart chakra in reverse, implying that our every action is an expression of love for our common humanity. There’s no reason to reinvent the wheel. At the Roasters Foundation, our goal is simply to bring together the various components and help them roll in the same direction, toward a better, healthier and happier community for the future. Many people and organizations are working to make our community a better place: governments, non-profits, corporations, foundations, associations and private individuals. But sometimes they work in different directions, with results that are less than they could be. * What is entrepreneurial philanthropy? Emphasizing both profitability and accountability as the best forms of sustainable development and poverty reduction, entrepreneurial philanthropists are private individuals who act in the name of social justice and not from profit-seeking motives. (American Enterprise Institute for Public Policy Research, 2007).